In 1713 the British government offered £20,000 pounds for anyone who could produce a marine chronometer to determine longitude to within 30m. The 'longitude problem' had dogged navigators for centuries, and was solved by a Yorkshire joiner and self taught clock maker called John Harrison . On a return journey to Jamaica in 1761-2, his clock lost under two minutes, and won the prize. (Though government procrastination meant it was not fully paid before his death fifteen years later.) One of the clock's features was a pair of contra-rotating pendulums, linked by springs. This technique allowed the adverse effect of the rolling ship on one pendulum to be compensated by an opposite effect on the other pendulum. But what does this have to do with bellringing? 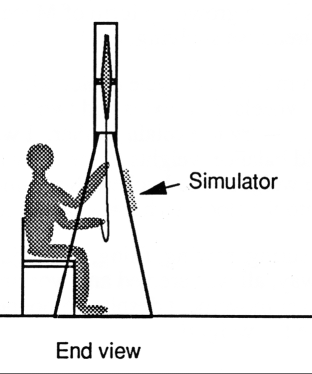 With the advent of simulators, several people have built dumb bells to practice ringing away from the tower. But there are problems in providing enough weight to replicate the 'feel' of a normal bell. 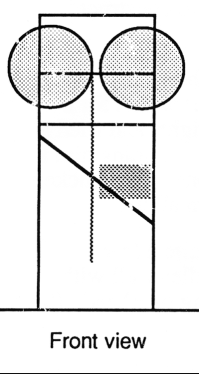 The lateral force of a swinging bell is roughly twice its weight, so either the 'bell' must be very light, or the 'tower' must be very strong and heavy. I wanted to build one, but it seemed anything with a satisfactory feel would be unsuitable for the spare room. 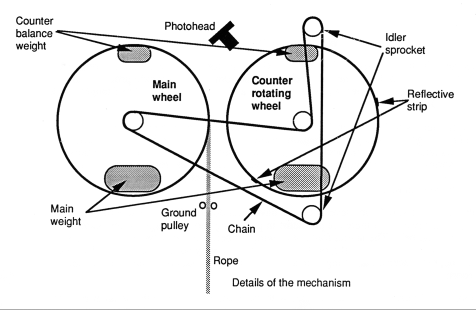 For a long time I puzzled over mechanisms with cams and hanging weights in an attempt to simulate the desired movement without the side forces, but to no avail. Then came the break through - counter rotating wheels. (At this stage I had no idea I was emulating the work of my name sake over 200 years earlier). But could I make the concept work? I would have liked wheels side by side, to save space, but there would still be a twisting force, and the link between the two wheels would be complicated. So I settled for an arrangement like a bicycle. I used cycle technology as well. Lead weights are clamped to the spokes, and a double length of chain goes opposite ways round the sprocket on each wheel. After bouncing ideas off several colleagues, the design for the 'tower' crystallised, using Dexion. (Dexion is like a grown up form of Meccano, widely used to construct laboratory equipment, warehouse shelving, etc.). I bought the cycle parts from the local cycle dealer who thought I was slightly mad. (What sort of bike has two back wheels, four axles and two chains?) I told him it wasn't for a bike, but thought it best not to try to explain further. I wanted lead for weights and tried a local car tyre dealer for old balance weights to melt down. It turned out I was doing him a favour. He puts the scrap weights into buckets, but someone had stolen one of the buckets and tipped the weights onto the floor, so he was happy for me to pick them all up. After many hours of measuring, sawing, filing, and adjusting, and with quite a few modifications along the way, everything was erected and working. The 'bell' handled well with barely any perceptible tower movement. Initially, the total rotating weight was about 40 lbs, distributed between the two wheels. Having proved the principle, I then made much larger weights and roughly doubled the total rotating mass - a total of 78lbs of lead (2/3cwt). The weight is distributed evenly between the two wheels, and also distributed between the two opposite sides of each wheel (shown as counterbalance in the diagram above). This has the same effect as 'tucking up' a real bell, and slows down the natural rate of rotation. The first build had a ratio of 1:3 between the bottom and the top, but after experimenting, I changed this to 1:2, so the 78 lbs is now distributed 13lb on the top, and 26lb on the bottom, of each wheel. The natural ringing speed of this 2/3 cwt 'bell' is roughly the same as a 6cwt normal bell in the tower, but of course it needs ringing with a much lighter touch. It is critical that the wheels are properly synchronised, since the forces generated by each wheel are quite large, but when rung normally, there is still negligible tower movement. People who try to ring by brute force rather than by feeling what the bell is doing make it move a bit, but they also make a mess of their striking. The dumbbell has travelled a long way since 1995. It went to three Ringing RoadShows , and about a dozen ringing courses. The structure survived the many ringers who 'had a go'. (There are over 350 names in the 'visitors book'). 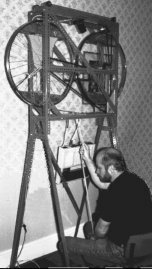 The picture on the left shows an experienced ringer ringing it during one of the Easthampstead residential ringing courses, and the picture on the right shows it at home. Ringers don't normally sit down to ring tower bells, but in this case you need to because in a frame that is only 7'3" tall (because it is designed to fit in a normal house room) the bell is much closer to the ringer than it would be in the tower. 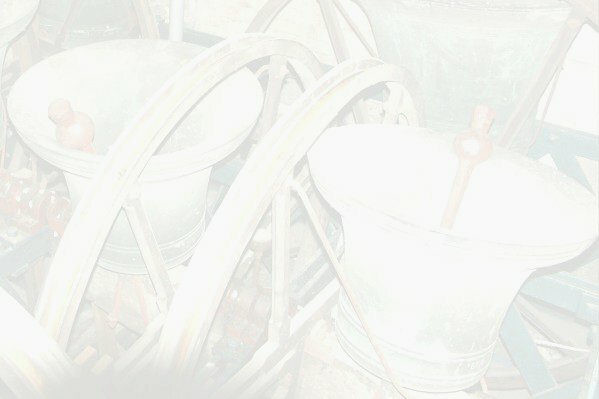 Because the bell is so light most ringers ring with one hand at backstroke and the other at handstroke, rather than using both hands at both strokes as they would with a tower bell. And the connection with John Harrison's solution to the longitude problem...? He was faced with a rocking ship, and in his early designs he used two linked pendulums so that the effect of the ship movement on them would cancel out. I don't have a rocking ship, but a light weight tower that I don't want to rock. I use counter rotating wheels so that the effect of them on the tower (ship) movement would cancel out. It's the same principle, but in reverse. Is it a coincidence that two John Harrisons used the same principle? Could we perhaps be related? I haven't tried to look back through the records, but it is not impossible. In the 1840s, my great great grandfather lived in the West Riding of Yorkshire, within 30 miles of where my namesake lived before he left for fame in the south a century earlier. More about John Harrison and his chronometer . Contact me if you would like to know more, or would like information about the construction.